If you’ve been waiting to graduate to a professional-level instrument, now is a great time! From April 1 through June 30, 2017, most of our professional-level instruments will qualify for a rebate! 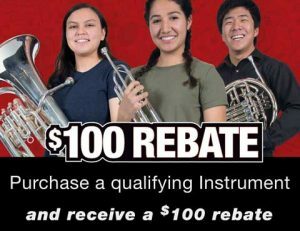 Yamaha is offering a $100 rebate for the rental or purchase of a new professional-level instrument (600-level or above, 500-level or above for flutes). We currently carry flutes, clarinets, alto saxophones, tenor saxophones, trumpets, French horns, trombones, and euphoniums that are available for rent AND qualify for this special rebate! 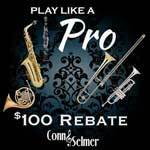 Conn-Selmer is offering a $100 rebate on all new professional American-made trumpets, cornets, flugelhorns, trombones, or French horn from C.G. Conn. Vincent Bach, King, and Holton. Many of these instruments are available on our rent-to-own program! If you have any questions, please call your sales associate at 1.800.382.1099 or email us at sales@paigesmusic.com.